trifle performs all of the background tasks that process the image files and data from hilda and publish them to the image server. 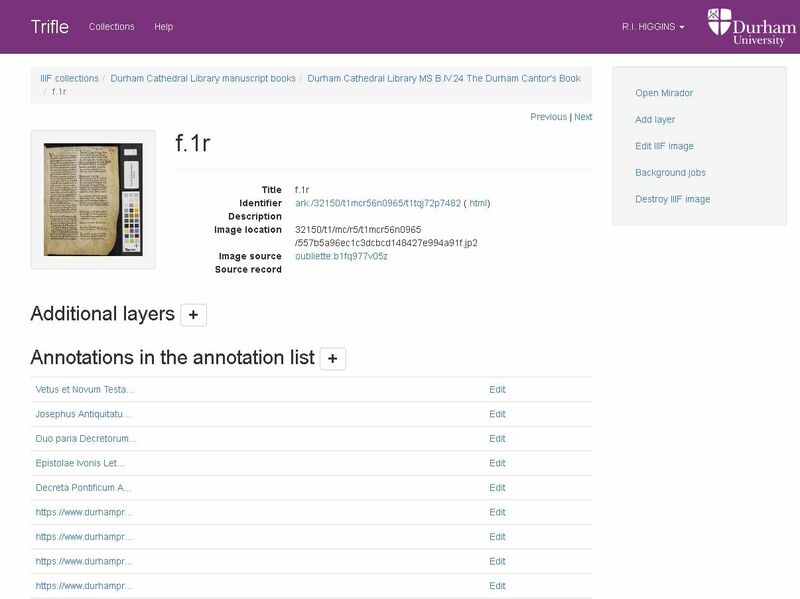 It also provides an interface for adding to the basic IIIF metadata to enhance the viewing experience. During the hilda ingestion the relevant information is assembled and sent to trifle, while jpeg2000 versions of the images are generated and sent to the image server. 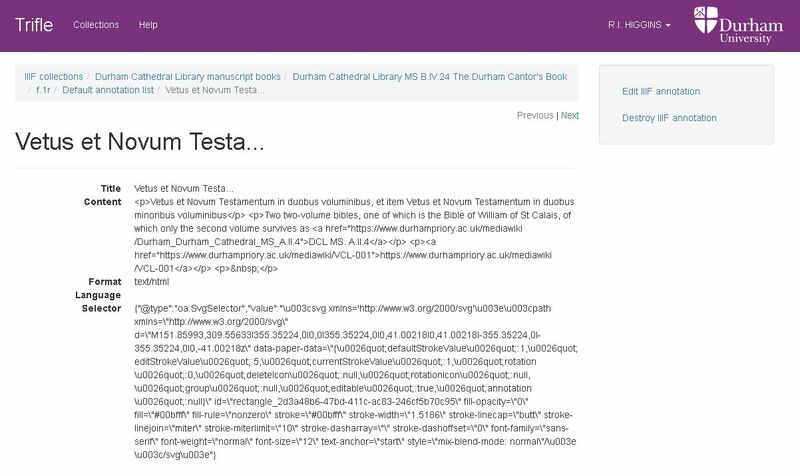 trifle places images in their collections and maintains the links with the catalogue description of the item digitised. 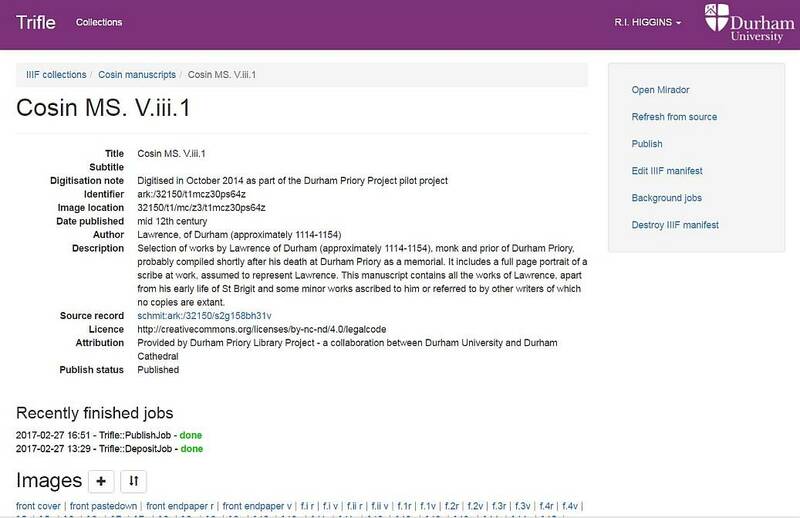 It retains links to all the subordinate images within a digitised volume and the order in which they should appear and creates a IIIF manifest to publish this information. As a background process (currently overnight) all of this is sent to the image server and made public. 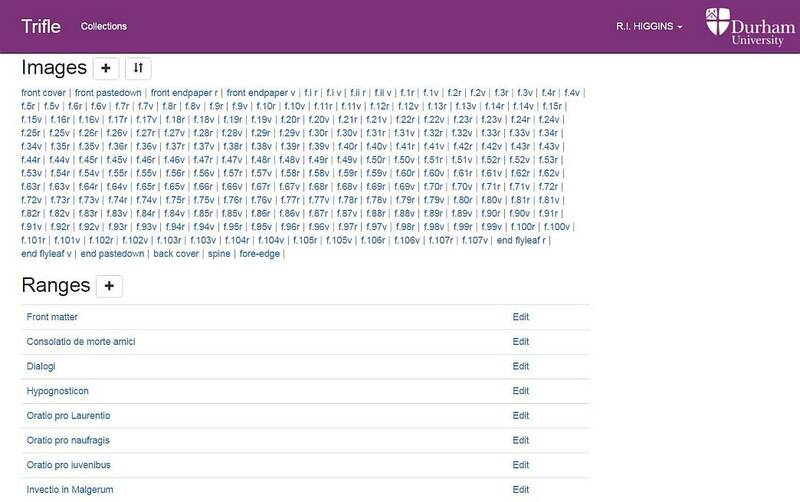 Ranges are a particularly useful element for understanding the structure of an online book, as they can be rendered by viewers as a table of contents and so enhance navigation. 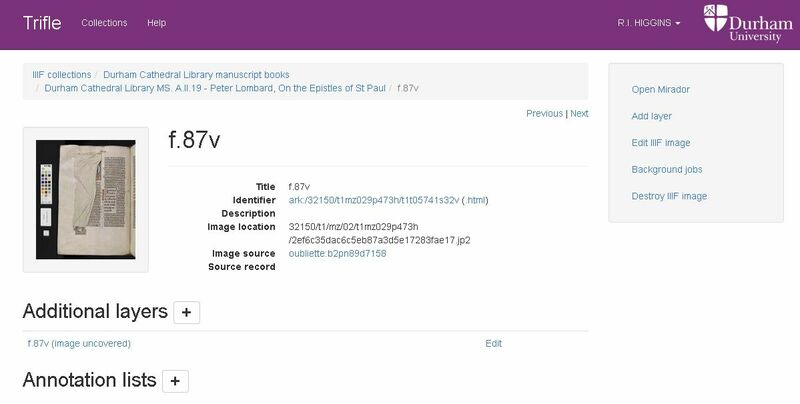 They are extremely tedious to create by editing the IIIF manifest text directly, so trifle provides an interface for creating them much more easily. 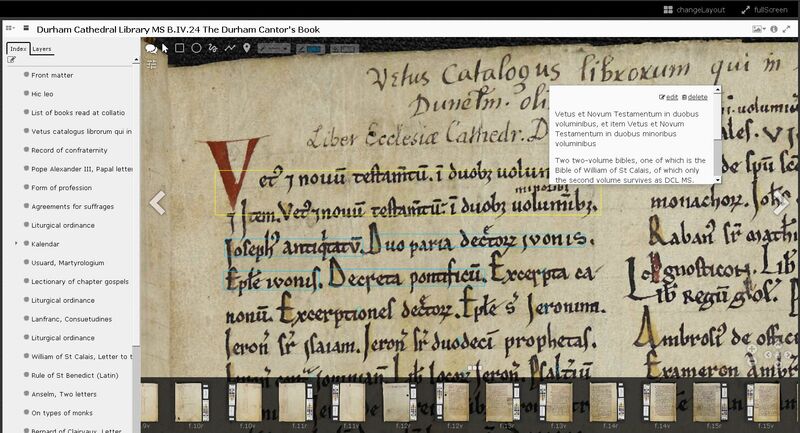 It is possible to open the IIIF-compliant viewer Mirador within trifle and use it as a visual editor for the manifest. The left-hand column open in the Mirador viewer here represents an editable table of contents. The plus sign adds a new entry and then the thumbnail images of the relevant pages along the bottom of the viewer are selected and dragged over on to the entry to populate it. Entries can include the same image (items seldom end neatly in manuscripts) as other entries, and can be nested to multiple depths. The table of contents can then be saved and published as a new version of the manifest to the image server. although this is not the easiest thing to do for anything more than minor changes to the text content. each area then opens a text editor with which the annotation can be made and saved. Once published, this will be available to the public if the annotation button is clicked. Annotations can also be used to display more than one image per canvas: a suitable viewer allows you to switch between or combine these images. trifle enables the conversion of images from the same group into a layer for another image. 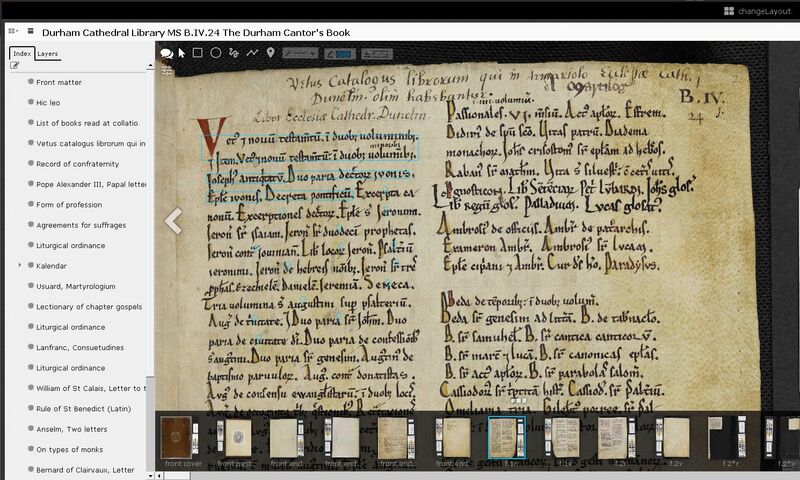 The result of switching between the two layers here gives a reveal effect similar to lifting the cloth in the manuscript when viewed in Mirador.